Back in December, FTVLive told you that Griffin Communications which owns Oklahoma TV stations KWTV (Oklahoma City) and KOTV (Tulsa) bought a group of radio stations from Scripps. It did not take the company long to notch their first big firing. Griffin told Shannon Potts Franco a.k.a. "Sunny Leigh” that after 15 years, her services were no longer needed. It appears sunnier days are ahead for Leigh. 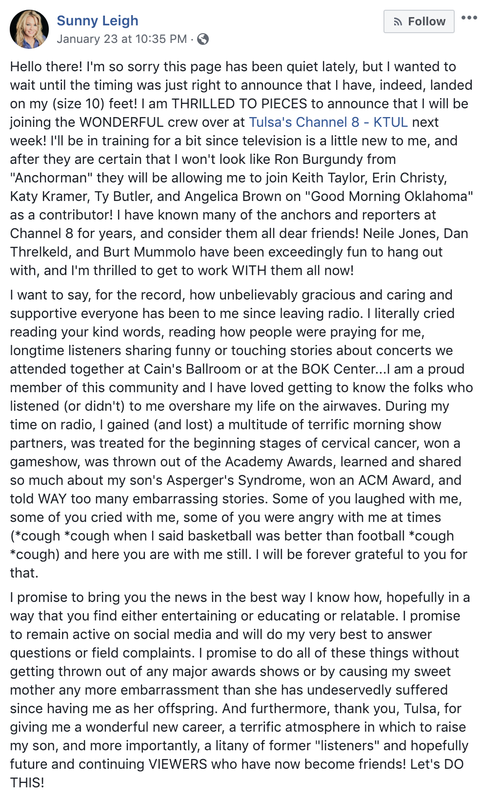 The longtime radio personality has landed a gig at Sinclair’s KTUL in Tulsa.